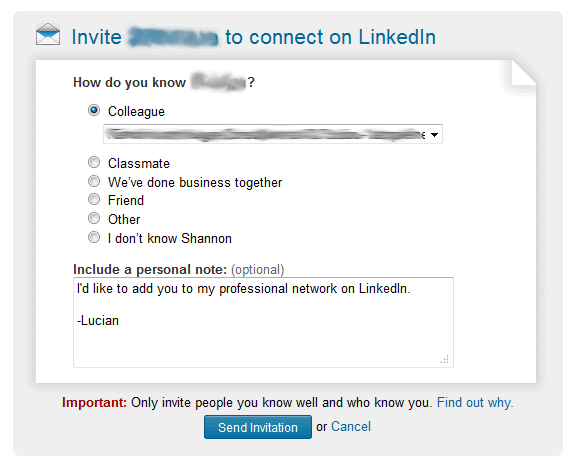 I am one of the early adopters of LinkedIn and I had a great respect for them. Thhey built a strong and usable application, they were fair and trustworthy. I strongly promoted them without being at all affiliated to this company and I also spent countless of hours to enlarge my network and keep my profile updated.But my confidence dropped to the lowest level a few days ago, when I tried to reach one of my former colleagues – somebody that worked in the same company with me.This is the option you typically have: But this is what I got: So what is inline help saying? Knowing that you cannot control who is rejecting an invite, and what motive he/she would indicate when rejecting it, indeed you can probably be banned after you get the warnings. 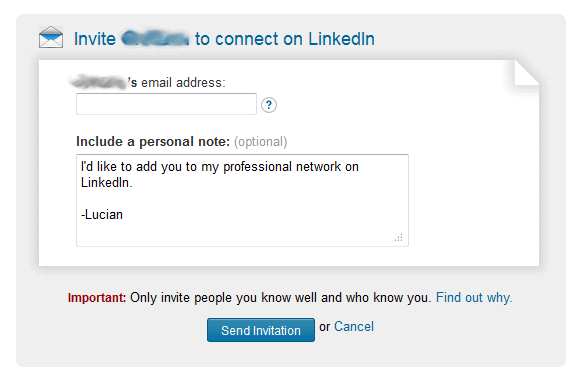 (Needles to say, each time I invited somebody that I don’t know personally, I wrote a polite note. It’s in my job description to know how to build online community. )So I wrote to their customer service to understand how I can get back the full functionality.Now comes the interesting part and here is exactly what they responded to me:”everyone is allowed a certain number of Invitations to be sent without requiring an email address to members identified as a “Friend”. After that allotment is depleted you will be required to enter an email address. “They also pointed me to their User Agreement (Section 4, sub D), this part:”LinkedIn may limit the number of connections you may have to other Users and may, in certain circumstances, prohibit you from contacting other Users through use of the Services or otherwise limit your use of the Services“I’m not a legal expert, and it looks to my understanding that they are legally covered by it.On the other hand, I think that each of the LinkedIn user must know about this rule which is not clear and actually is hiding this “certain number of Invitations” that nobody knows about it. 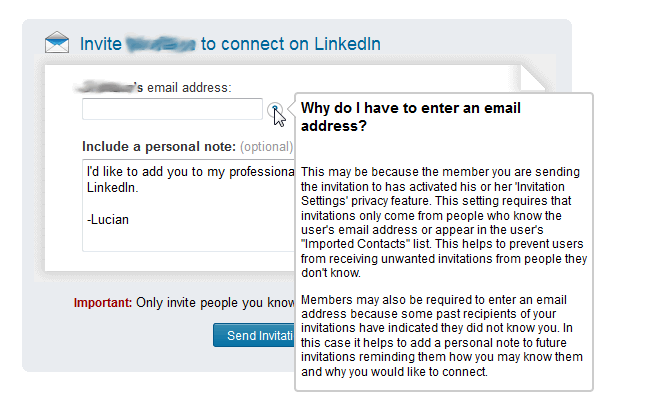 I would expect to know from the beginning that I’m allowed to send a particular number of invites, and after that, regardless what I do, I have to input an email address there.My final note: All of us should be aware of the implication of trusting this kind of online social services and be more circumspect when we start to put effort in building an online network. What to do now? Probably focus my attention to the ones that are still keeping their openness and promises. Google+ perhaps? At least there you can download all your data from your account when you want..Still, I’m waiting for the open and distributed social network model. There are a few outside, and probably the most important and promising one is Appleseed.I’ll start to build there! And bye-bye to the ones which are having hidden rules and tries to control you.—-PS – Shortly after I mentioned to their support the problem above, I received from LinkedIn an invitation to join for free (for a month) the Pro account… So I deduct from here that all these things happened because they changed rules and they wish to increase the revenue by pushing the LinkedIn power users to pay a Pro account.And I feel they try to take advantage of me.. Be aware, you can be the next. Maybe the rule was always there in case Pro and Advertising revenue dropped. Still, they should’ve presented the maximum number of invitations on the Free accounts. Looks to me that they tried to cover in one phrase two situations – when forcing a user to pay – and when limiting a user for something he/she did. Yes, you right, this is the point; if you have a condition like that, you must make the number public.